Four 8.5"x11" sheets of heavy cardboard, printed black on "eye saver" green for easy reading at a distance. 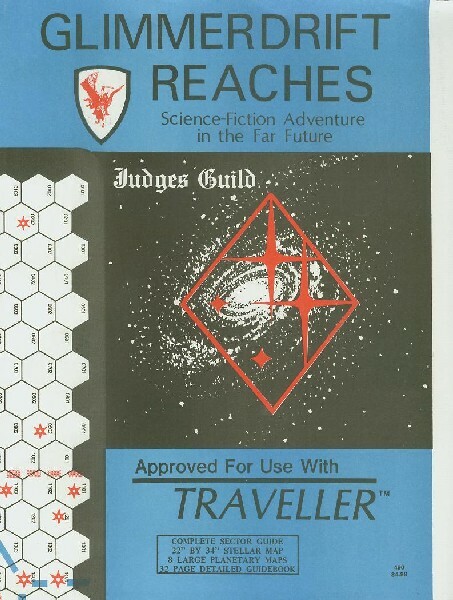 All charts and table necessary to play Traveller are reproduced on them, those items needed by the Judge on one side and those needed by the players on the other. Combat charts have all appropriate modifiers figured in. All weapons from Mercenary included also. Sheets may be fitted together to form a screen, concealing the Judge's confidential information, secret die-rolls and such. 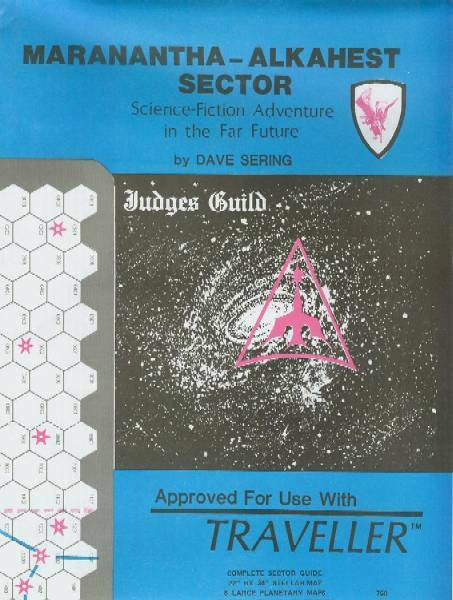 This playing aid is ideal for playing out a prepared scenario such as Dra'k'ne Station, and has been especially designed and approved for use with Traveller. Succinct 64-page summary of character generation with convenient rearrangement of the appropriate Traveller tables. 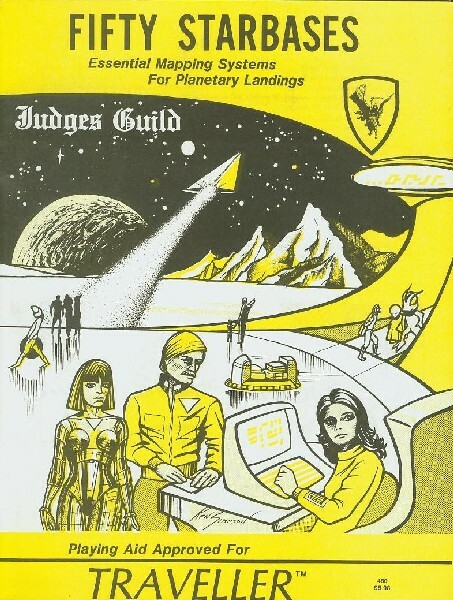 Provided are new tables on physical characteristics and personal background, new and accurate combat damage tables for all standard types and auxiliaries, complete intersteller trade tables, summary of starship operations, character record sheets (10), and complete sets of Ship's Papers (6). 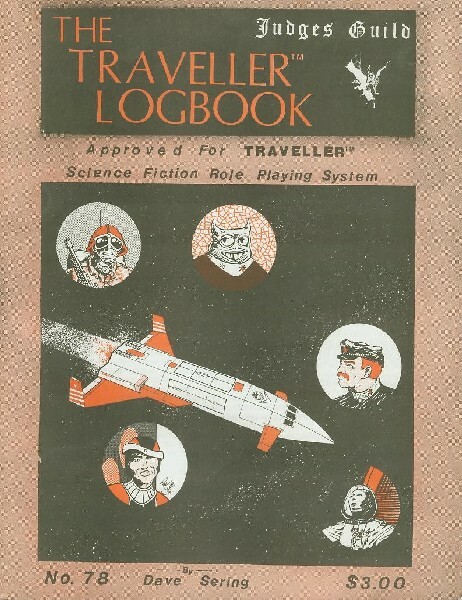 The Log Book is one of our best-selling items and can be seen in use at many gaming conventions. It has been created and officially approved for use with Traveller. Three 22"x34" sheets, 25mm scale, three-color Deck Plans of all standard Traveller starships and auxilaries, complete technical data, Ship's Papers and layout grid for your own starship design. May be used with 25mm miniature figures and Snapshot rules to simulate hand-to-hand battles on board ship; mutinies, hijacking, boardings, savlage operations, and other adventures. It includes High Passage cabins, Low Passage berthing spaces, bridge, engine room, fuel tanks, cargo holds, and all compartments. The designs are blueprint-style diagrams, including a Type C Cruiser, a Type R Subsidized Merchant, a Type Y Yacht, and such auxiliaries as a Ship's Boat and Life Boat. This playing aid has been officially approved for use with Traveller. A 64-page booklet detailing a vast alien research station hollowed out of an asteroid. Sabotaged, with its crew either dead or in cold storage, it drifts through the void awaiting the incursions of players, still protected by its automated defense systems and one surviving alien. A complete, massive 12-level adventure for Traveller, the first of its kind, this playgin aid is profusely illustrated by Kevin Siembieda and includes insights on the culture, language, and history of the wierd, reptilian Dra'k'ne aliens. This is a complete, well-detailed scenario, with several different types of research labs, repair shops, spare parts depots, recreation areas and more, and has bee created and approved for use with Traveller. 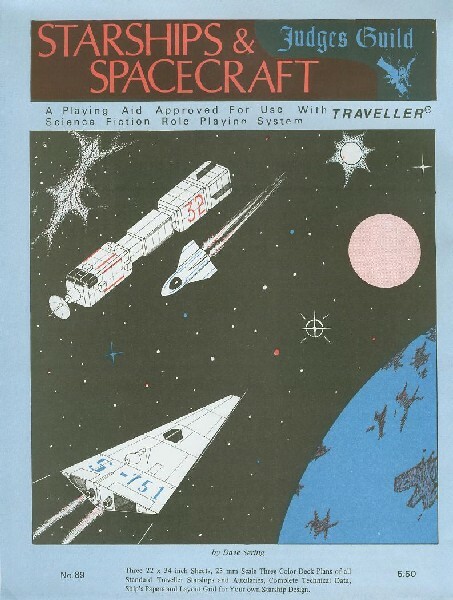 A 48-page booklet detailing the Tancred System, located in the Outreamer Sub-Sector of Ley Sector. Included is a complete description of an entire civilized planet as well as other significant installations on other planets. Tancred is an excellent place to start a Traveller Campaign. many opportunities for character particiation exist in the on-going revolt against the current regime. All major cities are mapped and described with encounter tables provided. The centerfold contains an 11"x17" two color map of the planet. Complete details are provided for a B Class Starport. Four special scenarios are included to get campaigns underway. Featured on the cover are a complete set of 15mm scale armored fighting vehicles for the Mercenary Regiment detailed withing. An entire Travellor Sector on a 22"x34" map with accompanying 32-page Guidebook. The map, in three colors, gives stellar location, jump routes, and political division. The reverse of the map has detailed maps of eight significant planets along with the statistics and complete historical background of each. The Guidebook goes into detail on each of the 16 Sub-Sectors with full statistics on each system. History and current political situation are given as well as encounter and rumor charts and table. This product is one of the first in a series providing a complete detailed campaign approved for use with Traveller. What's happening on the Darthanon Queen? This Traveller adventure pits the players against the unknown. Three basic scenarios can be used separately or combined into many possible adventures. This 32-page book includes pullout Ship Plans in two colors, plus map of Guadix Drift Sub-Sector. Crew and passengers of the Darthanon Queen are detailed along with the crews of two possible rescue ships, the Nova Hawk and the Lucky Winds. Everyone should be on the lookout for the Dyson, one of the meanest aliens you'll ever meet in the depth of Space. 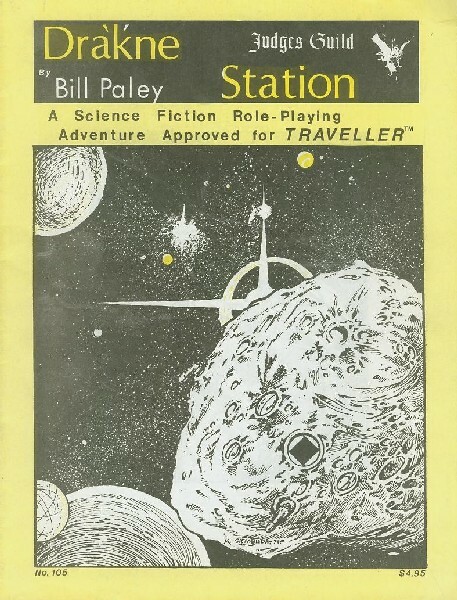 An official adventure approved for use with Traveller. A new playing aid for Traveller campaigns, this 96-page book provides the esential Starbases necessary to any spacefaring culture. Extensive tables are provided to detail the facilites of each Starbase, as well as the services available to Startravellers in the nearby area. Created and approved for use with Traveller. 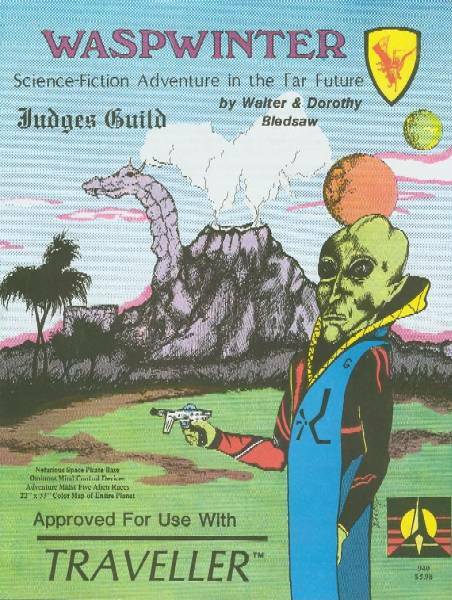 Glimmerdrift Reaches is the second entire Traveller Sector produced by Judges Guild. The 22"x34" three-color map gives stellar locations, political divisions, and jump routes in the Sector. Eight significant planets are mapped in detail on the back, along with complete historical background and statistics on each. 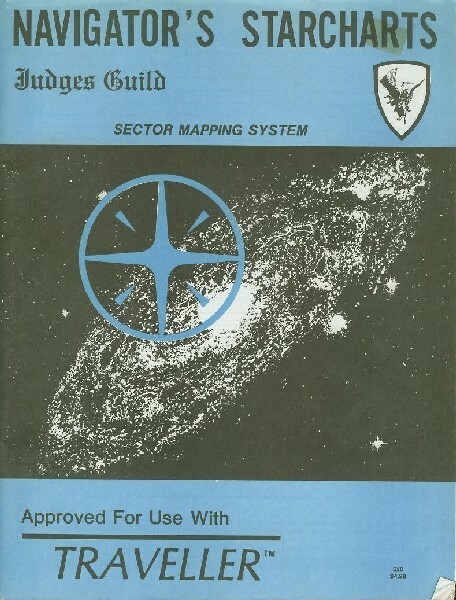 The 32-page Guidebook contains details on each of the 16 Sub-Sectors with complete statistics on each of the hundreds of systems. Background history is given on the current plitical situation, as well as rumor and encounter charts for the Referee. 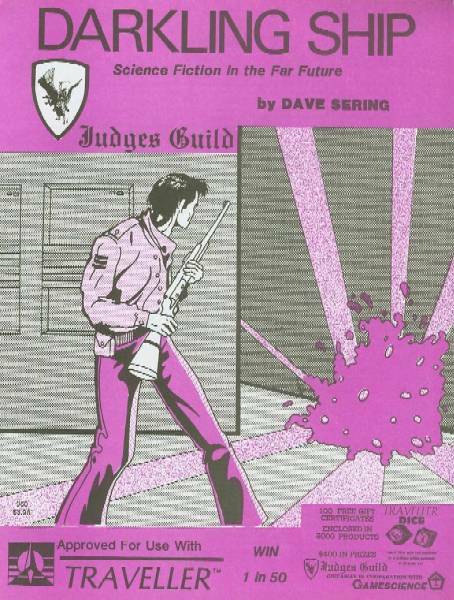 Doom of the Singing Star is Judges Guild's newest release for Traveller. Included within the 64-page Guidebook are scenarios covering hijacking, piracy rescue, and husts on shipboard, as well as security and mercenary assignments planetside. The package also contains 24 Giant 15mm scale Deck Plans for Cruise Liners of the Brilliant Gem Class. Designed as commercial vessels, the para-military capabilities of these ships permit them to play a prominent part in any campaign. A new mapping aid for Traveller campaigns, this 112-page book provides all the special grids for plotting six complete sectors. Each of the 96 Subsectors has a separate page with a map grid and planetary data blanks. Room for over three thousand stellar systems gives enough elbow room to get any campaign off to a Nova blast start. Created and approved for use with Traveller. 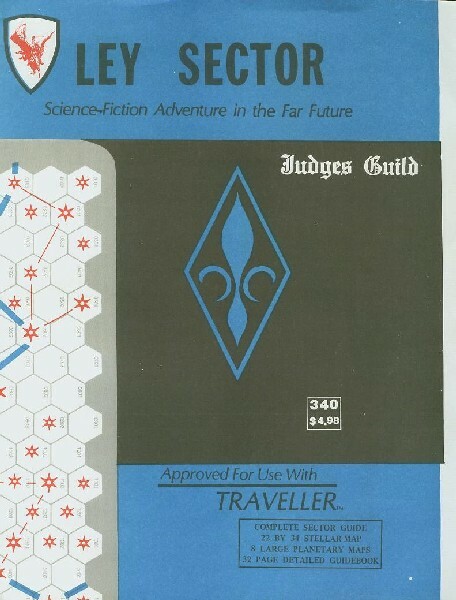 The third Judges Guild Traveller Sector with a 22"x34" three color map and a 32-page Guidebook. Part of the Gateway Quadrant Campaign, this product links with Ley Sector, Glimmerdrift Reaches, and the forthcoming Maranatha-Alkahest Sector. The map gives stellar location, political divisions and jump routes. Eight significant sector planets are mapped in detail on the back, along with complete historical background and statistics on each. The Guidebook details each of the hundreds of systems. Background history of the plitical and military situation is given, as well as rumor and encounter charts for the Judge. Created and approved for use with Traveller. This 32-page book with 22"x34" color map details a planet in the Maranatha-Alkahest Sector of the Gateway Quadrant. Complete details are given on the planet Ghostring, as well as on its sapien native race, the Hawklings. One major scenario is given with several additional variants detailed as well as suggestions for Judges modifications to suit the tone of their own personal campaign. 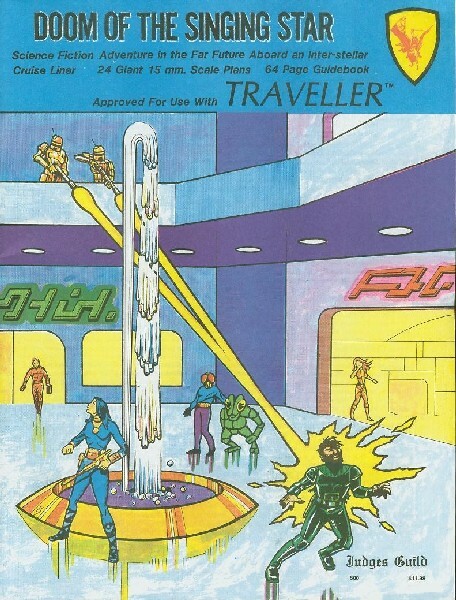 Ghostring is but one of a series of approved Traveller playaids designed to keep any campaign moving along at Jump 6! 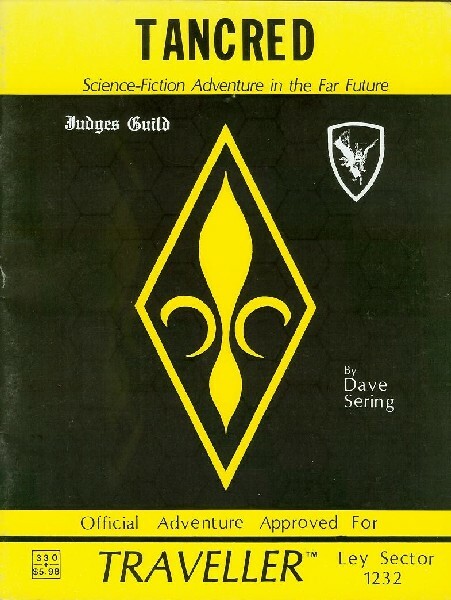 This 32-page adventure is the first in the Border Prowler Adventure Series set in the Gateway Quadrant. The basis of the scenario is a commando raid for information on an unknown installation. Complete personnel and equipement statistics are given for ships, assault shuttles, and opposition forces. This product is designed to serve as an introductory scenario to campaign gaming iwth a complete set of pre-generated characters. Also included is a scoring system for evaluating performance in tournament play. The same people and equipment are to be used throughout the entire series. New equipment featured in the series includes the 40-ton armoured assault shuttle and the 1000-ton Border Prowler Class Ship. All maps and encounter tables are provided for the Judge. Created and approved for use with Traveller. 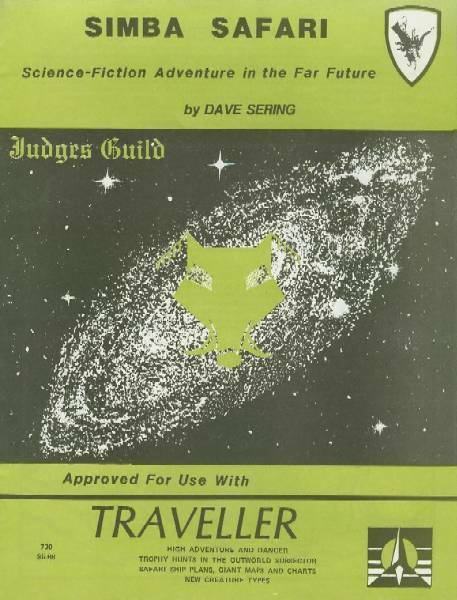 This 32-page adventure continues as the second in the Border Prowler Adventure Series set in the Gateway Quadrant. though intended to be played as the second in a series, this adventure may be played on its own. The same personnel and equipment is used for this as waw used for Amycus Probe. New information is introduced into the ongoing plot. Complete personnel and equipment statistics are given for ships, assault shuttles, and opposition forces. This product is designed to serve as an introductory scenario to campaign gaming and provides a complete set of pre-generated characters. Part of the scenario is a scoring system for evaluating performance in tournament play. 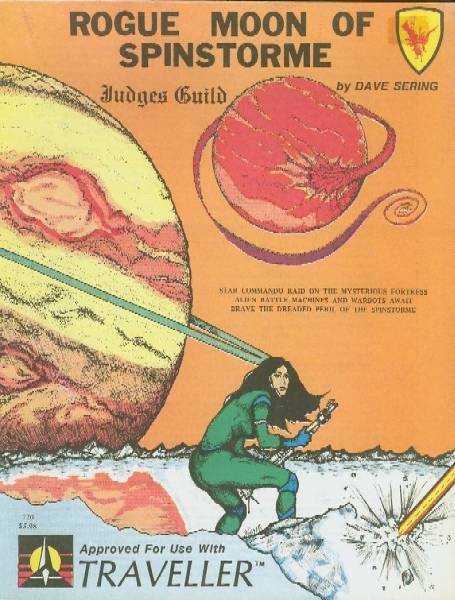 All maps and encounter tables are provided for this adventure set in the rings and moons of a gas giant planet. Created and approved for use with Traveller. This adventure scenario contains a 32-page Guidebook and a 22"x34" double-sided map sheet. Set in the Ley Sector of the Gateway Quadrant, the adventure features the "Simba Safari" and crew. Complete 15mm plans of the Type K Hunter Ship are included, as is a 15mm scale plan of the adventure site. The crew and passengers range across the planets of the Diamond - Prince Sub-Sector in search of trophies and adventure. Six planets ar provided in detail along with all terrain and animal charts. The scenario is completely detailed for the Judge, and suggestions are given for personalizing the adventure to suit the tone of his or her campaign. This adventure may be complete self-contained and use only the provided characters, or players may utilize their own characters. Created and approved for use with Traveller. 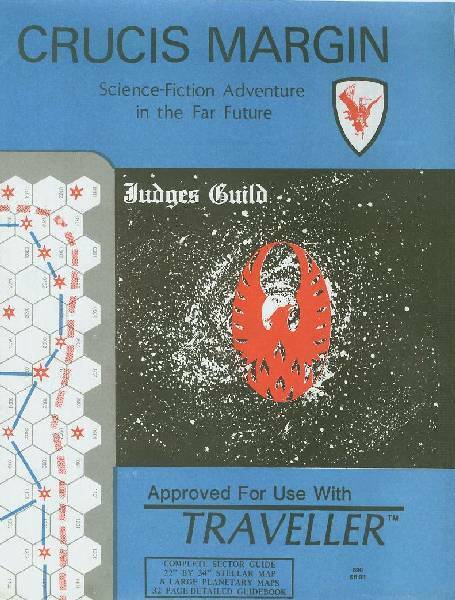 The fourth and final Traveller Sector completes the Judges Guild Gateway Quadrant Campaign background. This product contains a 22"x34" three-color map and a 32-page Guidebook. The map gives Stellar Locations, political divisions, and jump routes in the Sector. The reverse of the map has eitht significant planets of the Sector mapped in detail with historical background and statistics on each. The guidebook details each of the 392 Systems. Background history of each of the 16 Sub-Sectors is provided as well as political and military information on the nine significant interstellar states, empires, sultanates, and einarchys located here. Complete events, rumors, and encounter charts are provided for the Judge in this product. This product has been created and approved for use with Traveller. This 32-page adventure is set in the Union Crucis of the Crucis Margin Sector. Contains details on the planet Mellansel, the Space Pirates and Corsairs operating in the sector, and the hidden pirate base. Details and deck plans for a Hellbeast Type P Corsair Starship. Plus four scenarios. Created and approved for use with Traveller. 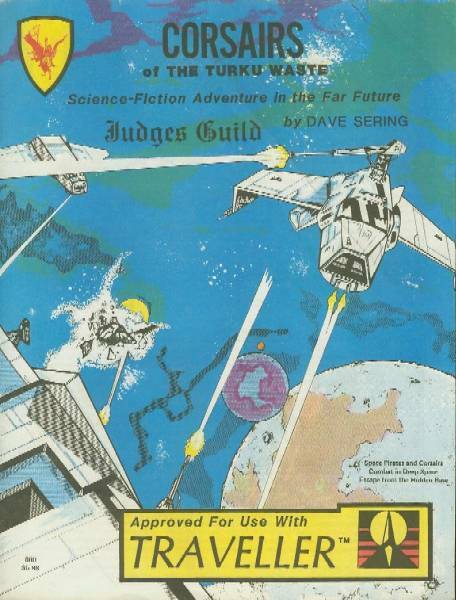 High adventure in the far future as Space Pirates scourge the starlanes. Vicious mind control devices enslave hapless captives. the Pirate's Starbase and the entire planet of Waspwinter are detailed for play. Five subject races are listed along with encounter tables for the life and land of the planet. Contains a 32-page book with 22"x34" color map of the planet. 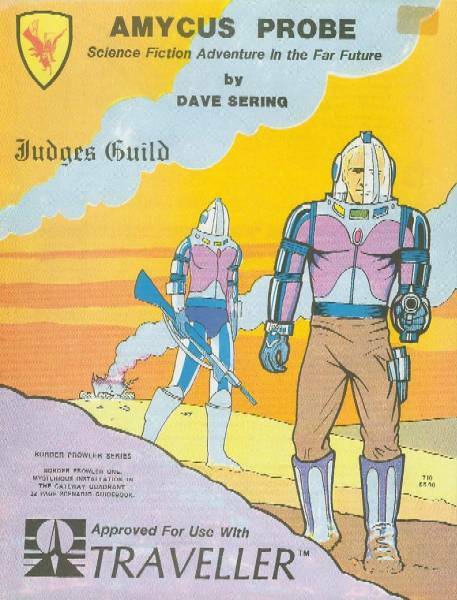 Waspwinter is another of the Judges Guild Planetary Guide series created and approved for use with Traveller. 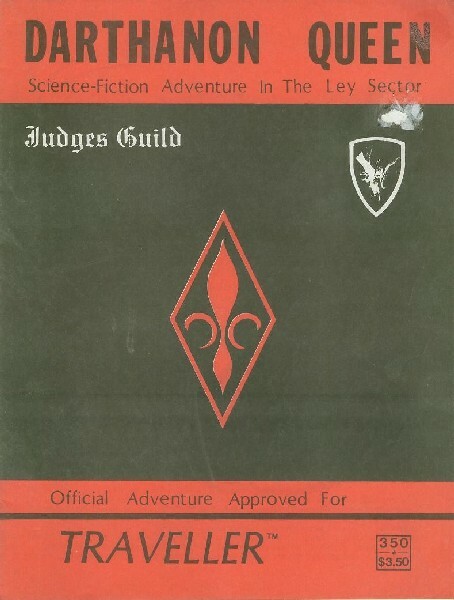 This 32-page adventure is the third in the Border Prowler Adventure Series set in the Judges Guild Gateway Quadrant of the Traveller campaign universe. 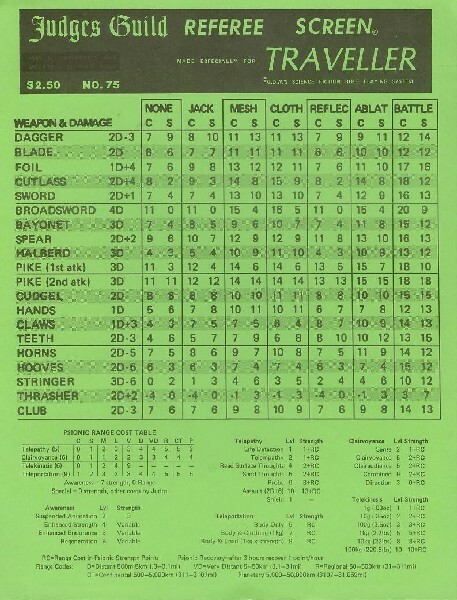 Set up in tournament format with handout sheets of information, equipment, and pre-generated characters. Created and approved for use with Traveller.